Why Dispose of Medications Properly? Don’t Rush to Flush! Our residential septic systems and wastewater treatment plants are not designed to break down the chemicals that make up medications. Therefore, if we flush expired or unused medications, we can contaminate the creeks, rivers, lakes, wells and groundwater. Accidental Poisonings! Per the Poison Control Center, 55% of accidental poisonings occur with children 5 years old and younger. The risk of a child or grandchild from accidentally ingesting medications increases when we store expired or unused medications in our homes! “Pharm” Parties! This consists of the collection of a variety of medications and then being randomly ingested. This leads to the misuse of prescription & over-the-counter medications and is a growing problem. If medications are disposed of properly and regularly, the opportunity for medications to be taken from our homes and misused decreases. It has been estimated that as many as three billion used sharps are generated in homes and other unregulated sites throughout the U.S. Current sharp disposal regulations only apply in the health care settings such as doctors’ offices & hospitals. This leaves family members, solid waste haulers & recycling workers exposed to the possibilities of injuries and/or exposure to infectious diseases. * If you find a needle in a public area, DO NOT PICK IT UP, contact your local law enforcement immediately. They will pickup and dispose of the syringe appropriately! 1. Pick up a FREE sharps disposal container at the Boone County Health Department. 2. Fill the container with sharps only. 3. 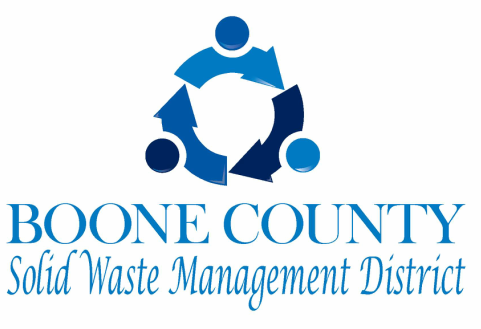 Return the Container back to the Boone Co. Health Dept. They will dispose of it safely & properly. The District sponsors an annual REUSE Heart & Sole program the week around Valentine’s Day. REUSE Heart & Sole is a District wide shoe collection event where we can provide shoes to a new pair of feet! We typically don’t think much about our shoes. We outgrow them, wear them out, or change styles without much thought as to what happens when we discard them. The truth is that discarded shoes can take over 200 years to decompose in a landfill which is a shame when there are so many people in need of shoes locally and all over the world. In past collections, we have had schools, libraries & other organizations participate as collection locations. If you are interested in hosting a collection spot, please contact the District office. The District supports Changing Footprints, a Central Indiana non-profit that redistributes shoes to those in need all over Central Indiana. 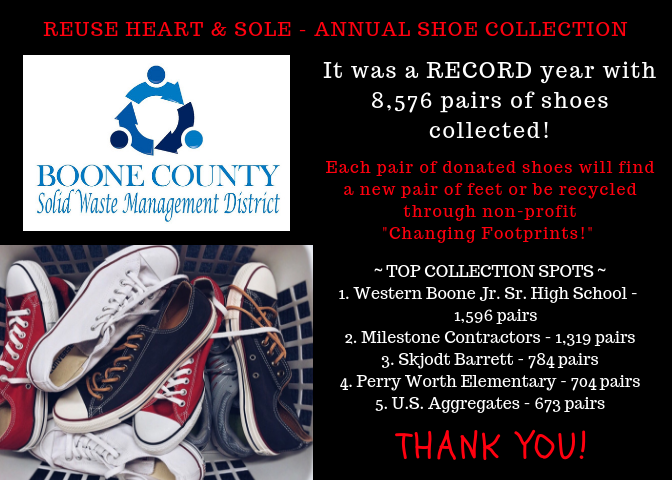 During the 2018 collection, Western Boone Jr. Sr. High School collected 970 pairs of shoes. To reward their efforts, the District purchased a recycled plastic bench to be placed at their school and used for many years to come! To work towards the District's mission, the District is pleased to offer an opportunity for youth to learn about recycling and earn a recycled plastic bench for their school or other affiliated organization. The District will sponsor the fee (up to $300) for a six foot colored bench with back. All youth organizations and schools, from pre-school through college ages are eligible for the program. The bench earned though the program must remain at an organization located in Boone County. Each organization has the opportunity to earn one bench per calendar year on a first come, first serve basis. The District has limited structured funds and reserves the right to not be able to sponsor a bench at the time it is requested. The Lebanon Boys and Girls Club collected 400# of plastic lids in exchange for this great bench to be used at their Club! The Lebanon - the Cleanest City in Indiana campaign began back in 2010 with an initiative from the Rotary Club of Lebanon. They had a desire to see Lebanon be litter free and they wanted to lead by example. This campaign is lead by a committee that meets on a monthly basis. Currently, they meet in the board room at the District's office. Main components of the campaign include, but are not limited to: An annual spring clean-up event, monthly "Throwaway Thursday" clean-ups, an "Adopt-a-Spot" program and much more! If interested, contact the District for more information! In 2017 & 2018, the Veteran's Service Officer & Center Twp. Fire Chief, Mike Spidel, received community grants from the District to purchase the flag collection bins. His goal was to have them placed throughout the County to ensure proper and respectful disposal was available to everyone!